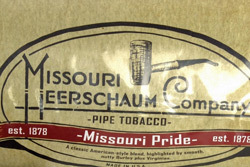 This is the second installment of a series of reviews I have lined up for you, again from the Missouri Meerschaum line of tobaccos, blended by Russ Ouellette. Missouri Pride in its description appealed to me in the slow, cold month of February. Described as “…A classic American-style blend, highlighted by smooth, nutty Burley plus Virginia.” Something simple for a month many people see as something to trudge through. It comes just like the others in the line, a plastic-encased printed paper pouch–nothing fancy, and nothing overstated. 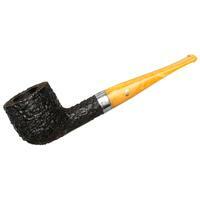 In the pouch the tobacco’s aroma is a little sweet, a little fig-like, toasty and also smelling very gently of molasses. The ribbons are cut more as a shave than in long strips. 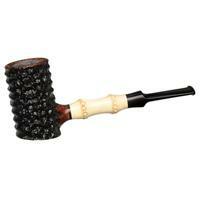 It wasn’t difficult to choose a cob pipe from the same makers as an obvious choice, which takes to loading perfectly fine. 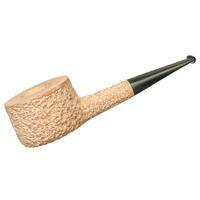 This tobacco was designed for cobs, however, I found no problem with grabbing a favorite briar and smoking away, either. First lights really make the Burley take center stage, which leads me to believe the Virginia content is not quite in equal parts. Burley to me is either love or hate, and sometimes lower-quality Burley has an almost dusty, woody taste to it that I’m not particularly fond of. 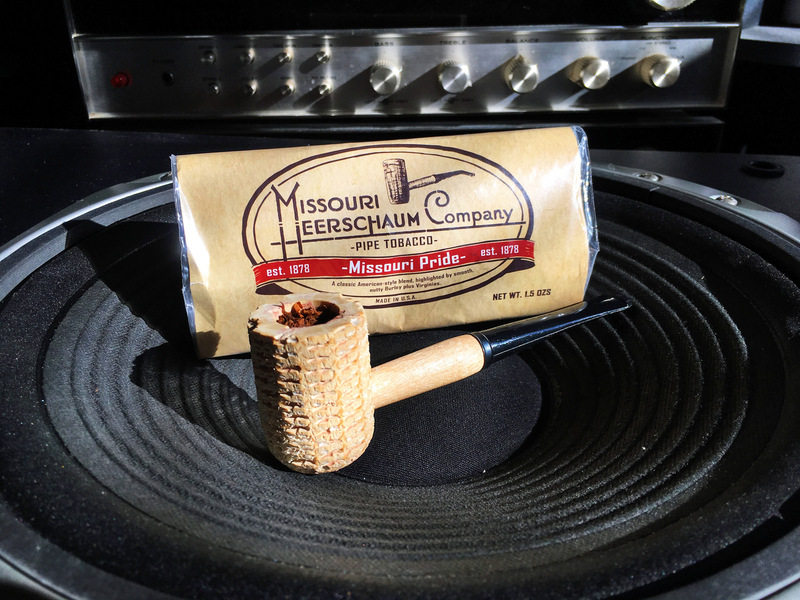 I really like what was chosen for this blend, as Missouri Pride’s Burley provides a warm richness and a great mouth-feel. What I wasn’t too crazy about was what seems to be a light casing that suggests maple sugar. It’s most noticeable right where the upper and lower palate meet. While not overpowering, it was noticeable and distracting at times. I was really hoping to find where the Virginia was hiding, if I’m to be completely honest. 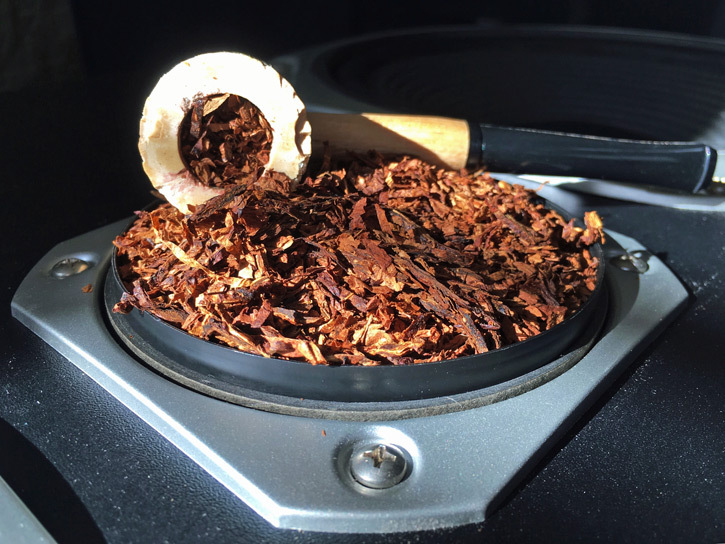 Virginia often can cut through to the surface of a blend and give facets of flavor when smoke starts to get flat, and I simply don’t believe there was enough of it for this task. Mid-bowl the maple factor tends to mellow out, and there comes a little meatiness to the nutty side of the Burley, with a little hint of lemon here and there. Interestingly, this is where I now notice the maple sweetness in the ambient smoke. This is a great thing for those social puffers around other people. I got quite a few compliments on the aroma, which usually I’m not used to getting! I notice a particular look creep across the mugs of individuals, judging me for smoking more noxious and delicious crowd-jeering leaves. I make no apologies. What usually happens, sad to say, is what is pleasing to those around you comes at a price via one’s own tongue. That is unless you’re an aromatic smoker, and by all means, please smoke your cake and eat it, too. Pardon me as I jest. The last parts of any bowl of Missouri Pride were probably my favorite. Burley has a magical quality that often gets overlooked, it acts like a sponge. Usually chosen for aromatics due to this quality, when it’s good stuff on its own, it releases the marinade of smoking a bowl down to a final hurrah. In Missouri Pride’s case, the Burley has compounded itself many times over, like a folded puff pastry, and there’s a rich, buttery tongue-tingling treat at the end. Lesser-than, leathery and lower-leaf Burley doesn’t do this, as it usually ends up tasting tar-like and can be rather bitter. It further reinforces my assumption the Burley in Missouri Pride is as good as it gets. Like the last review I did of this line, I can’t stress enough to forgo the pouch packaging and jar this tobacco once you get it. Without added humectants keeping it soft (which I applaud), you will eventually have a small satchel of something akin to crispy breakfast cereal. Would I call Missouri Pride an aromatic? No. Is it too sweet for yours truly? Maybe. If you must have a comparison, think high-class Carter Hall. Once a favorite of mine, I only reach for something like this only rarely. 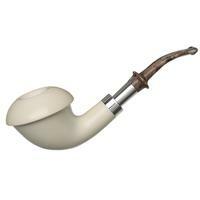 Overall the tobacco loads into pipes wonderfully, performs stellar and the nicotine satisfies; and it doesn’t offend the neighbors. If you couldn’t tell, I have a serious crush on the Burley in the blend, I simply might not like the maple-esque nature of it. Except for a wee drop of the real stuff on pancakes, it’s not a go-to flavor for me. There’s gonna be guys that go ape over this blend, especially those who want a very light aromatic for public relations or to dial down (or up) their sweet tooth. As an all-day blend or something to pass the time while shoveling the snow out of the driveway, this could be your next best friend. Great review, and accurate. I ordered some of this a while back and was pleasantly surprised, as I was half expecting a run of the mill OTC flavour. It’s far more than that. I should have known, Mr Oulette is yet to disappoint me.